The Accademia is the only example among Italian academies originating in the Renaissance to have assumed the form of a productive modern organization. The current Accademia (which became a foundation in 1998) is flanked by an academic organization with 70 active and 30 honorary members that includes the most prominent Italian and foreign musicians, and a symphony orchestra and chorus known and appreciated throughout the world. Thus, it unites activities promoting the culture and heritage of music with a superlative didactic tradition, and above all, with internationally famous concert programming in continual expansion. Between 1990 and 2000, it passed from around 100 concerts and events a year to the current figure of two hundred-fifty, articulated in two seasons (symphonic and chamber music), to all of which is added: a summer season, exhibitions on educational themes (“Tutti a Santa Cecilia” for children and young people of all ages), repertoires other than ‘serious music’ (“Santa Cecilia It’s Wonderful”), chamber and polyphonic choral repertoires, theme festivals, and tours in Italy and abroad. 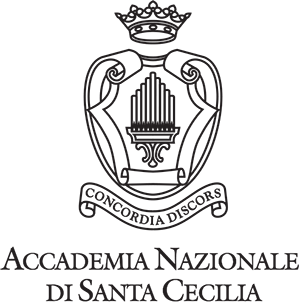 As far as didactic and training activities are concerned, in accordance with the recent reform of the Conservatorio, the Accademia Nazionale di Santa Cecilia aims to become a center of excellence for outstanding musical education. Soon other courses will be added to the traditional intensive high-level courses instituted by law in 1939, flanked as always by specialization courses and masterclasses that include Opera Studio, a laboratory conducted by Renata Scotto. The historical patrimony, completely reorganized and catalogued according to the most modern technologies, has been transferred in 2005 to the new Multimedia Library. The Accademia Nazionale di Santa Cecilia’s museum of musical instruments has been inaugurated in 2008 and it holds one of the foremost collections of instruments in Italy.